EFree scientists from Penn State, Carnegie, and Arizona State University, have discovered how to produce ultra-thin diamond nanothreads that promise extraordinary properties, including strength and stiffness greater than that of today's strongest nanotubes and polymer fibers. This exceedingly strong, stiff, and light material has an array of potential applications, from more-fuel efficient vehicles or even the science fictional-sounding proposal for a “space elevator.” Their work is published in Nature Materials. The team included Penn State's Thomas Fitzgibbons, En-Shi Xu, Vincent Crespi, Nasim Alem, and John Badding; Carnegie's Malcolm Guthrie and George Cody, and Arizona State's Stephen Davidowski. They used a specialized large volume high pressure device to compress benzene up to 200,000 atm. At these enormous pressures, benzene spontaneously polymerizes into a long, thin strands of carbon atoms arranged just like the fundamental unit of diamond's structure - hexagonal rings of carbon atoms bonded together, but in chains rather than the full three-dimensional diamond lattice. The effect of pressure on solid benzene has been studied for nearly a century, but has remained enigmatic. Despite these efforts, researchers failed to realize that benzene formed a unique diamond-like nanomaterial when compressed. The principal reason was the techniques required for proper characterization were simply not available until now. 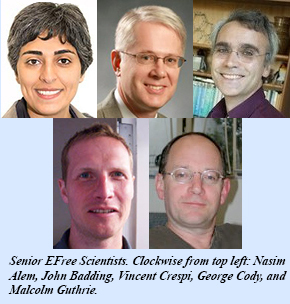 The EFree researchers used a high-pressure Paris-Edinburgh press, and characterized the materials by neutron scattering at the Spallation Neutron Source, Oak Ridge National Laboratory, as well as x-ray diffraction and Raman Spectroscopy. They compressed a 6-millimeter-wide amount of benzene, an amount much larger than used in previous experiments. 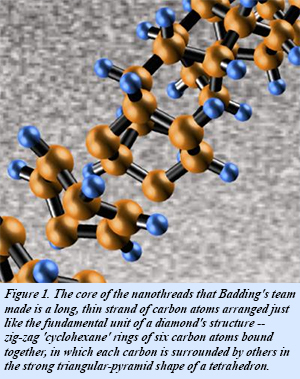 Their work also led to the realization that slowly releasing the pressure after sufficient compression at normal room temperature gave the carbon atoms the time they needed to react with each other and to link up in a highly ordered chain of single-file carbon tetrahedrons, forming the diamond-core nanothreads. The team is the first to coax molecules containing so-called aromatic carbon bonds to form larger scale molecular structures in the shape of long, thin nanothreads. The thread’s width is phenomenally small, only a few atoms across, hundreds of thousands of times smaller than an optical fiber, and more than 20,000 times smaller than average human hair. falseThe scientists confirmed the structure of their diamond nanothreads using a number of advanced techniques. Parts of these first diamond nanothreads appear to be somewhat less than perfect, so improving their structure is a continuing goal of the research, as is creating immediate practical applications and synthesis of larger scale quantities [T. Fitzgibbons et al., Nature Mater. doi:10.1038/nmat4088 (2014)].